What’s better than a plain old bench belt sander? A belt and disc sander combo of course. 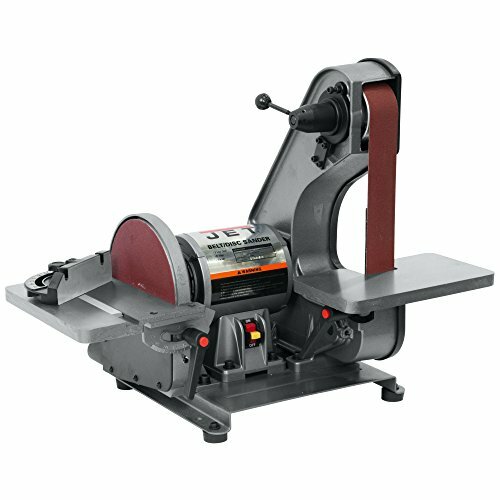 The Jet J-41002 is a small and neat bench belt and disc sander. It has several manners of adjustment which make it convenient to use for a number of light-duty applications. The belt aspect of the bench sander is provided in the form of a 42” long and 2” wide belt. Whereas some belt sanders can be quite tall with a single idling roller, the Jet J-41002 has two pulleys in a triangular formation which brings the belt further away from the motor, making it easier to work with, but slightly reducing the overall area you have to work with. The 2” belt is also advertised as being able to perform the duties of a jig saw, cutting from the side. The disc sander has an 8” disc which requires abrasive discs that have adhesive applied. Both the area of the belt and the disc sander are fairly enclosed, which makes for the perfect dust extraction environment. Each sanding area has its own 1.5” dust chute that can be linked to a vacuum system. Abrasives are not provided when purchasing the bench sander, but the dimensions are standard and can be purchased from any number of suppliers. Both the belt and disc are powered off the same ¾ HP motor. The motor runs on single phase 115V power, drawing up to 6.2A. At running speed the motor is rotating at 3450 RPM, which is directly linked to the disc sander. The connection to the belt results in a belt speed of 3100 SFPM. A power switch is located on the side of the motor housing and is simply actuated. When not using the sander, it can be locked in the off position. The switch has a locking tab which can be removed, preventing switch actuation. For its capabilities, the Jet J-41002 has a relatively small footprint of 21×23” and a height of 20” and weighs in at 58 lbs. That’s not a light tool, and you’ll most likely want to find somewhere permanent on your bench to leave it. It comes with four rubber feet to mount it on, but the same holes can be used to bolt it to your workbench. Working with this bench sander is made much easier by the inclusion of many quickly adjustable surfaces. Both the disc and belt have large cast iron tables with locking handles which let you change the angle of the tables. A belt tension handle allows for quick adjustments while working, and a removable platen can support sanding when required. On top of that a sliding miter gauge is provided for the disc table. The Jet J-41002 is a very capable disc and belt sander that deserves space on everyone’s bench. At a very reasonable price, this tool is well made, boasting a 2-year warranty. It can be easily adjusted to suit anyone’s needs and it’s all packaged in a small unit.